with the NEW and unique HBC UV-A1 Spot repair system. 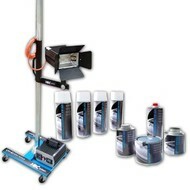 Fast, clean, easy to use and safe for either aerosol or spraygun. Traditional Spot repairs can take between 45-60 minutes, excluding curing time. Larger repairs which need filling can take even longer!